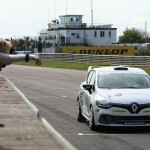 A 370 mile journey seen us arrive at Thruxton for Rounds 5 and 6 of the Courier Connections Renault UK Clio Cup. After the thrilling encounters at Donington Park just two weeks previous, we were keen to see who would come out n top at the fastest circuit on the calendar. 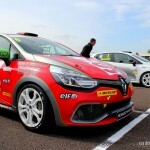 At 2.46 miles long with 11 corners and only two braking zones for the Clios, we were surely in for an exciting weekend. The Renault 5 GT Turbo championship winners prize car had unfortunately not made the journey with up this weekend however, we assure you that it will be with us once again at Oulton Park. 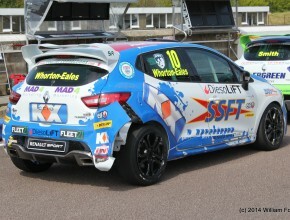 Saturday morning at Thruxton saw us greeted with glorious sunshine! 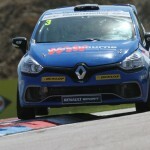 Clio Cup qualifying was scheduled for 11.20 and with no pre-event testing being undertaken by the Clio paddock, it was sure to be a frantic affair. The weather conditions saw the track temperature around 25°C, perfect slick tyre weather for the entire field. 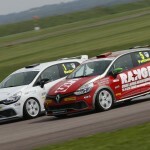 With the new car giving off a much larger “tow” than the previous incarnations of the Clio Cup car, team-work was the name of the game once again in qualifying. 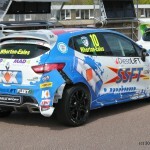 With times dropping throughout the 30 minute session lap 7 saw Lee Pattison posting a blinding 1.23.060 lap time, a full 0.403s faster than new Team Pyro team-mate Mike Bushell could manage, with a second place time of 1.23.463. 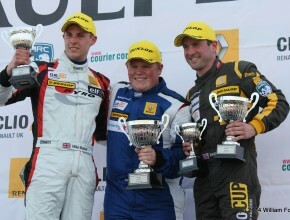 James Colburn managed a 3rd place in front of Rob Smith. 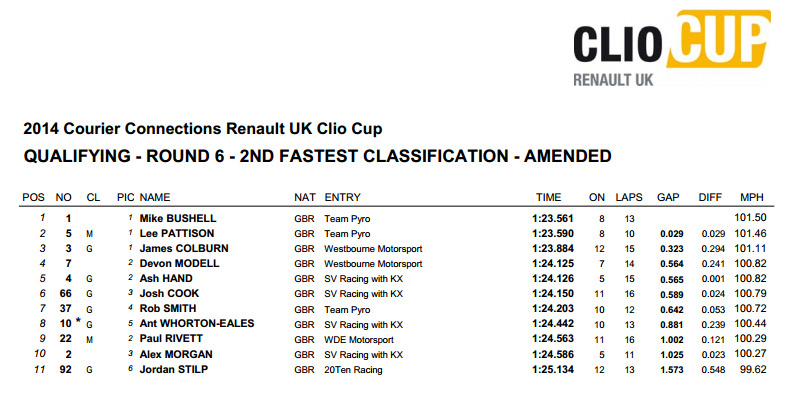 The grid looked set for Race 1 with an Team Pyro car on Pole and 2nd. 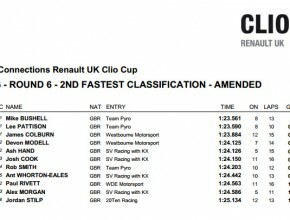 The Clio Cup grid for race 1 is determined by the drivers best time in the 30 minute qualifying session, while the race 2 grid is based on the drivers 2nd best times from qualifying. 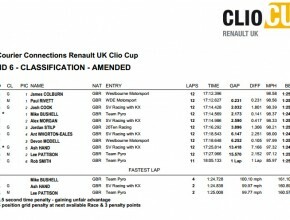 Mike Bushell had posted the fastest 2nd best time, putting him on provisional pole for race 2, only for the time to be disallowed based on track limits. A visit to the clerk of the course to explain, saw Bushell’s time reinstated to allow Mike to start race 1 from pole position, narrowly infront of Lee Pattison. 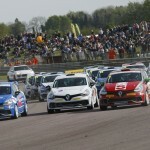 It looked like Team Pyro could have the upper hand this weekend at Thruxton with a season-best qualifying performance from the team. 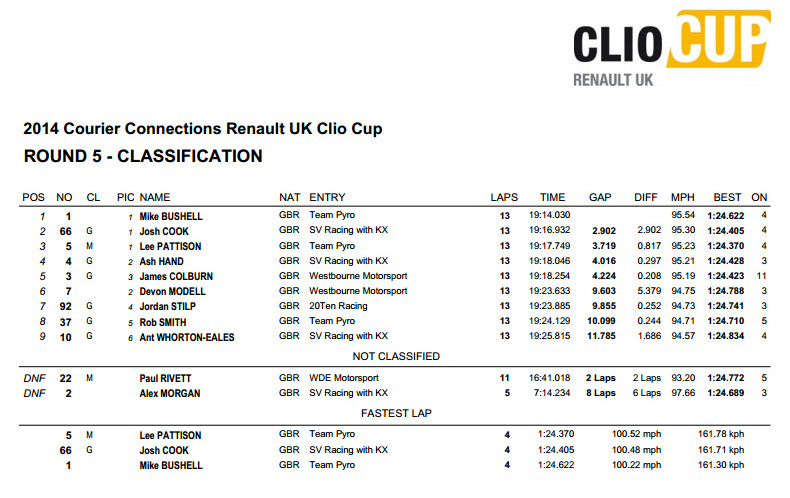 Points leader, Alex Morgan would start race 1 on P8 and race 2 from P10, proving once again the sheer competitiveness of the Clio Cup grid this year. Sunday morning brought more of the same weather conditions, dry and sunny, just the way we like it! 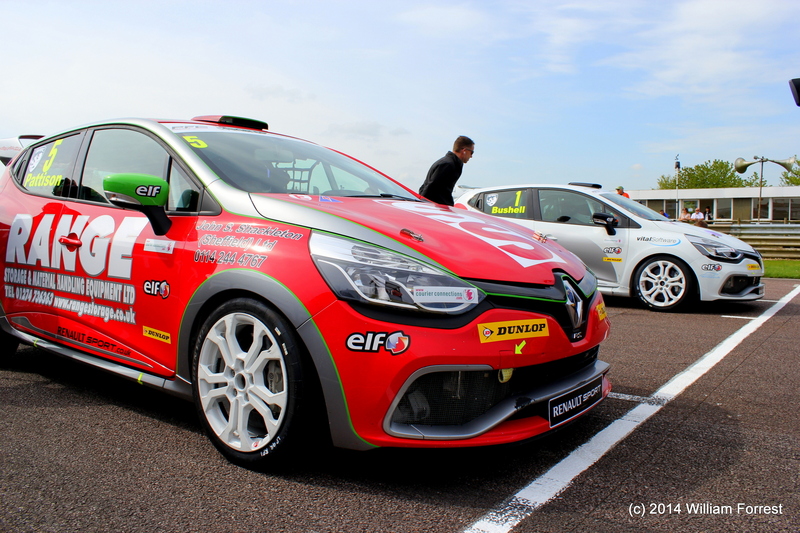 With the first of the days two Clio Cup races set to kick off the on-track action at 10.40 we couldn’t wait to see the cars line up on the grid. 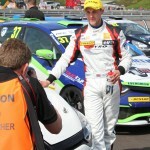 With Lee Pattison lining up on pole position beside Mike Bushell it looked like the cars behind would have a task on their hands to get in–front of the Team Pyro pair. 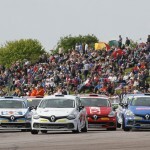 Its quickly lights out time on Round 5 of the Courier Connections Renault UK Clio Cup, with Mike Bushell managing a blistering start from P2 gets the jump on Pattison with James Colburn following him past unfortunately James couldn’t hold his space in third as SVRacing driver Josh Cook quickly made his way up the field from his 7th place grid spot into third behind Bushell and Pattison. 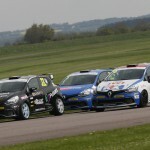 Meanwhile a fierce battle behind the leading trio saw a coming together between Rivett, Morgan and Whorton-Eales with Alex Morgan becoming the innocent victim and ending up lodged in the barrier at the outside of Goodwood corner. 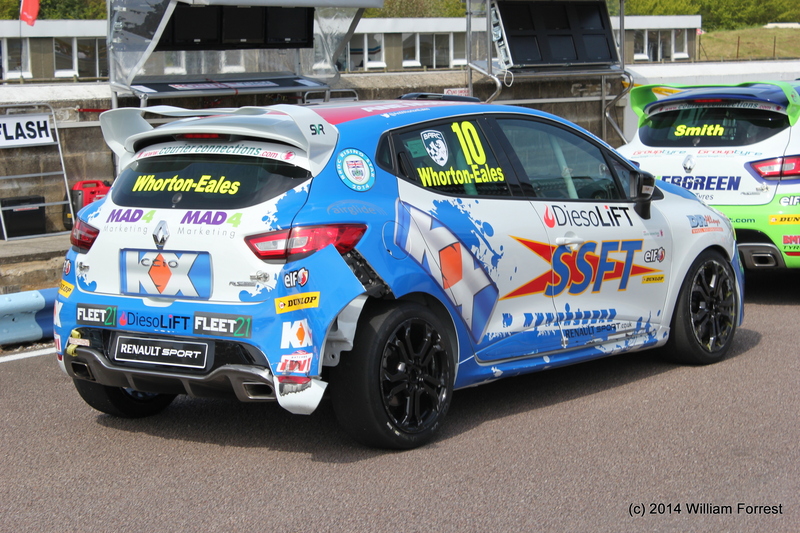 Whorton-Eales also sustained damage in the incident, putting his car off the pace with Ant bringing the car home to a 9th place finish. The saftey car was deployed in order to move Morgan’s car out of the way safely, therefore bunching the pack back up destroying Mike Bushell’s lead. 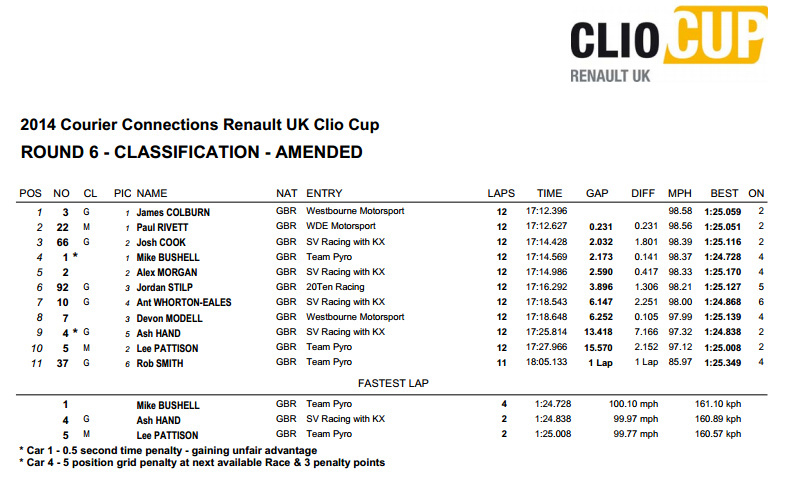 Fortunately Bushell got the jump on the rest of the pack at the restart, all but conforming his first ever Clio Cup race win. 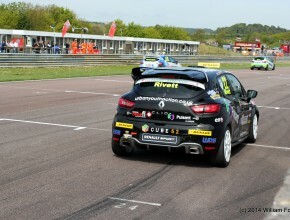 As Bushell lead the pack home, Paul Rivett pulled the car to the side and slowed to a crawl on his way over the start finish line at the end of lap 11, leading to a DNF for Paul, possibly caused by the earlier racing incident. 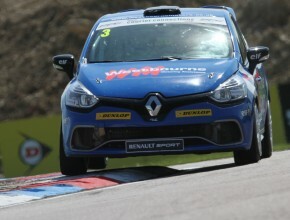 A delighted Mike Bushell had taken his first ever Clio Cup win, and also made him the first non SVRacing driver to lead a championship lap this season! 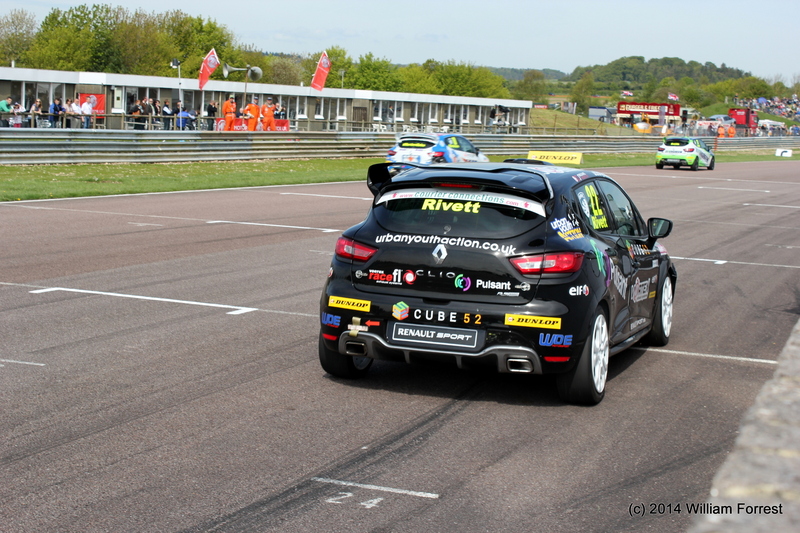 New Pyro team-mate, Lee Pattison managed to bring the car home for a third place finish, his best of the season also, confirming that Team Pyro would be the ones to beat at Thruxton! 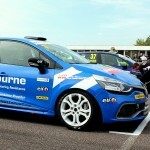 Courier Connections girls, Victoria and Sophie were on podium presentation duties this weekend, handing Mike his first place trophy after round 5 of the Renault UK Clio Cup. 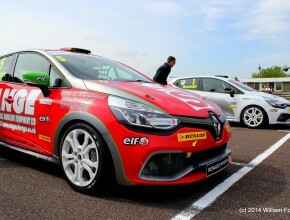 To allow for the paddock garages to repair any damage to cars sustained from the first race of the day, the second Courier Connections Clio Cup race was re-scheduled to take place at 16.25 and was shown live on ITV4 before the last of the days BTCC races. 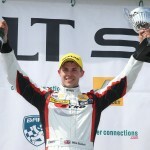 As Mike Bushell lined up on pole position for race 2, he was confident of the potential double victory. 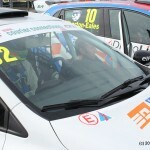 However, a poor start let Colburn through into first place followed by Pattison and Cook. 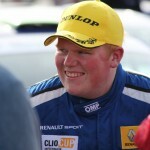 It would take a lot for Bushell to fight for a 2nd race win in succession. 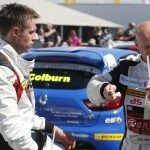 Colburn looked assured in the lead, and never really looked in danger for the first few laps. 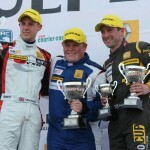 Meanwhile the battle was hotting up between Hand, Rivett and the recovering Bushell for the 3rd place spot. 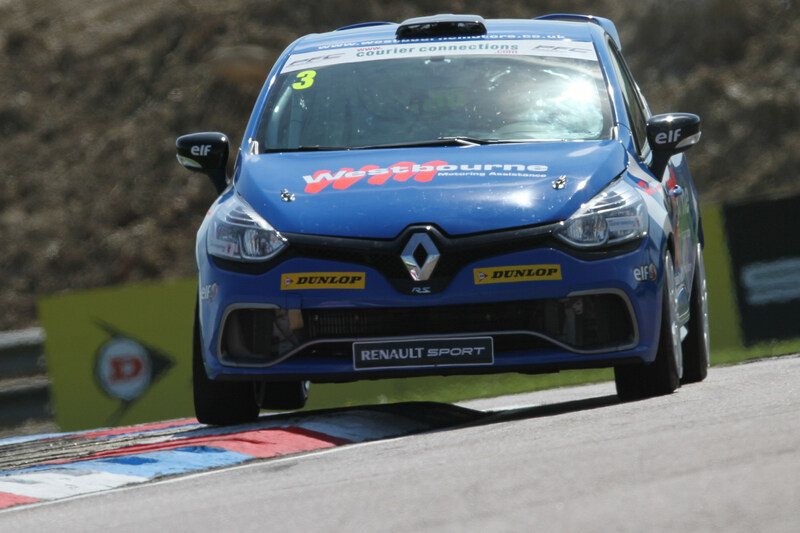 This time, Paul Rivett’s experice and class showed through to put the WDE Motorsport car up into 2nd place and chasing Colburn for the lead. 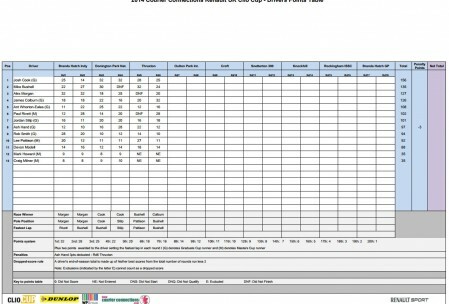 We looked set for another new winner in the season, with Pattison dropping back, and Bushell getting back up to third place bringing Josh Cook behind him. 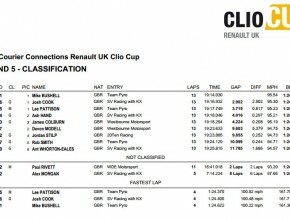 Rivett never gave up and pushed Colburn for the last few laps, a last ditch move by Paul saw both cars running straight through the final chicane, giving James Colburn his first Clio Cup race win of the season and Rivett best finish so far for the new WDE Motorsport team. 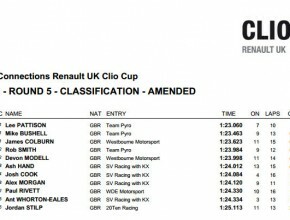 As we congratulated our 4th different race winner onto the top step of the podium, the race stewards had decided to issue a 0.5s time penalty to Mike Bushell for ‘gaining an unfair advantage’ therefore moving Josh Cook up to 3rd place in the final classifications and boosting his points haul for the weekend. 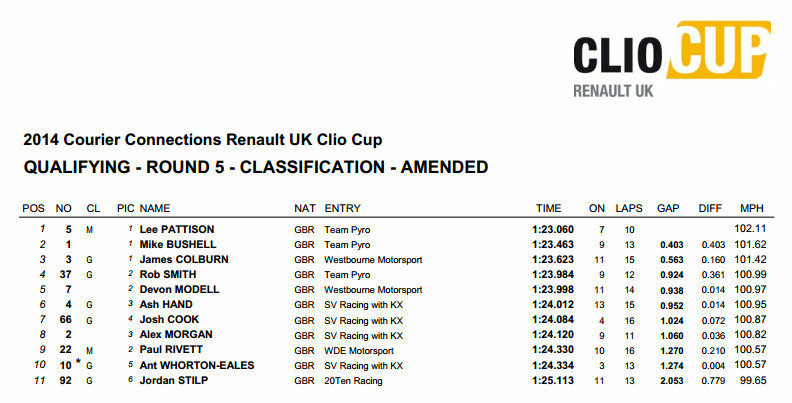 This, along with a DNF for Alex Morgan in race 1, would secure Cook’s place at the top of the points board as the teams packed up and looked to head home after a long hot weekend. 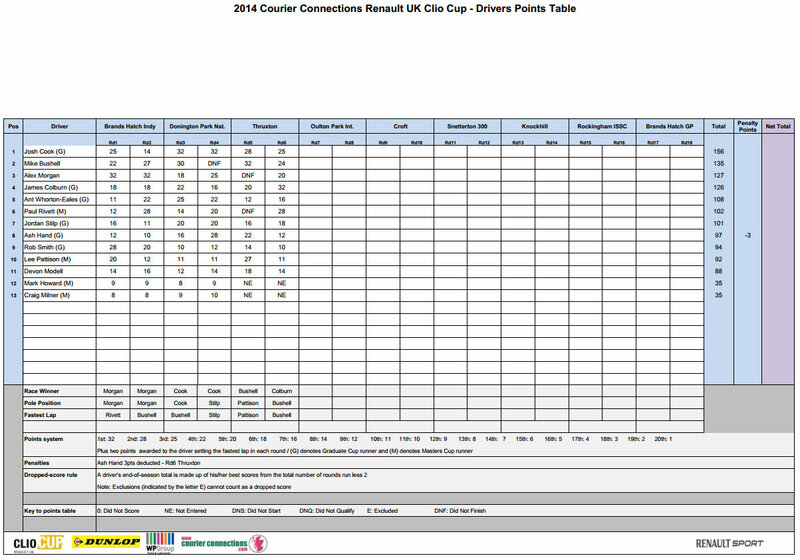 The points table now looks like this, after rounds 5 and 6 of the Courier Connections Renault UK Clio Cup at Thruxton, Josh Cook tops the table with 156 points with Mike Bushell trailing on 135 followed by Alex Morgan in 3rd with 127 points. We look forward to Oulton Park in a month’s time, where we will be back with the Renault 5 and we are certain to be treated to some more excellent racing. 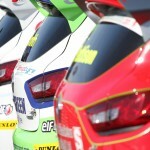 To keep up with all Clio Cup news, please like our Facebook Page or follow us on Twitter.